John N. Whittle has provided us with a copy of the Kinemacolor section from How to Make and Operate Moving Pictures, published by Funk & Wagnalls in 1917. The section comprised three pages and two photographic plates. That funny looking paddle shaped thing in the first photo is the single blade shutter. Located at the upper left in the picture is the governor used to prevent the dowser from opening before the projector has come up to the requisite speed. This was apparently to prevent the audience from seeing an objectionable red-green flicker. We welcome other conjectures relative to the governor. 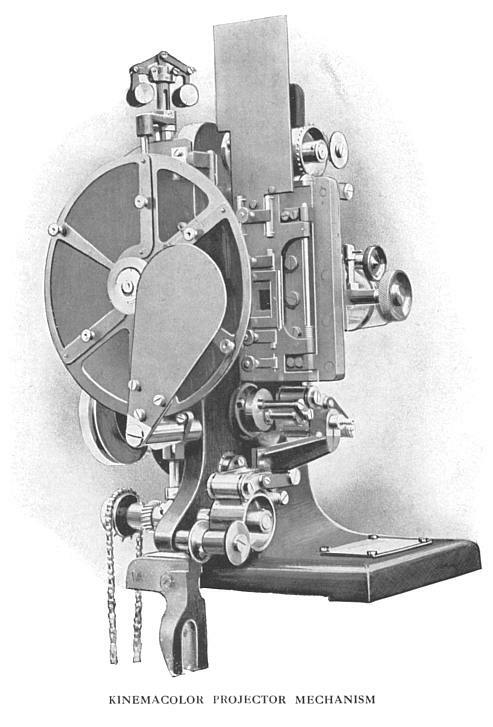 OF the many attempts to produce cinematograph pictures in natural colours on a scientific basis, as distinct from the method of painting or dyeing an ordinary film, the greatest amount of attention so far has been attracted by a system invented by G. Albert Smith, and commercially developed by Charles Urban under the name of "Kinemacolor." In this system (to quote from "Cassell's Cyclopædia of Photography," edited by the editor of this present book), only two colour filters are used in taking the negatives and only two in projecting the positives. The camera resembles the ordinary cinematographic camera except that it runs at twice the speed, taking thirty-two images per second instead of sixteen, and it is fitted with a rotating colour filter in addition to the ordinary shutter. This filter is an aluminium skeleton wheel (Fig. 133) having four segments, two open ones, G and H; one filled in with red-dyed gelatine, E F; and the fourth containing green-dyed gelatine, A B. The camera is so geared that exposures are made alternately through the red gelatine and the green gelatine. Panchromatic film is used, and the negative is printed from in the ordinary way, and it will be understood that there is no colour in the film itself.